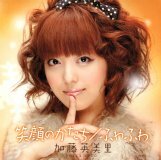 This CD contains the opening and ending songs to the TV drama Neko Taxi (ねこタクシー). Songs and talk by Katou Emiri (加藤英美里). Emiri appears in the TV drama in the role of DJ Michiru (voice only).